The Apocalypse, accompanied both by commentaries on its content and profuse and meaningful illustrations, spread throughout England during the middle of the thirteenth century. 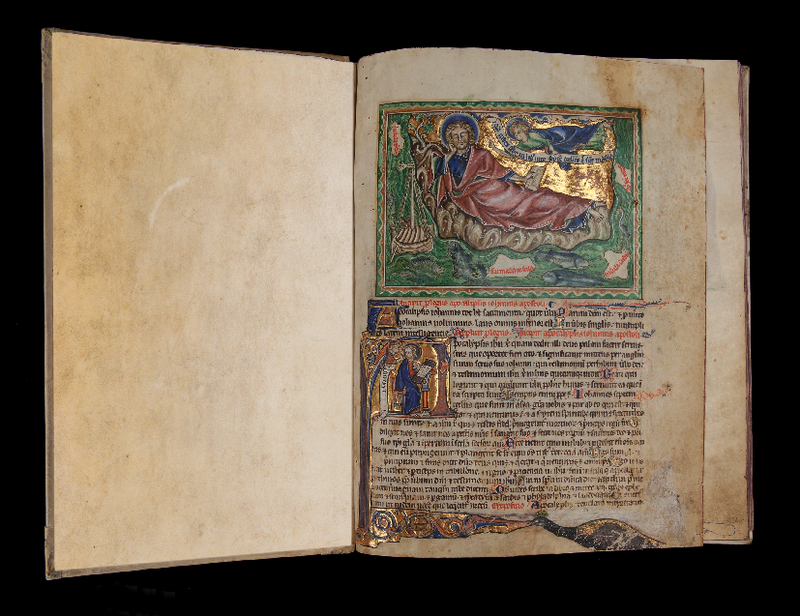 This particular copy, which is similar in iconographic and artistic terms to other contemporary Apocalypses, specifically those of Lambeth and Abingdon, was probably produced in a London workshop for an important patron. On each folio, the religious text and comments by Berengaudus, with borders of arabesques, form a column crowned by a miniature. Each miniature is set inside a rectangular frame, although in some cases, figures or architectural forms extend outside them. The events depicted take place in very restricted and densely populated scenarios whose intensity is heightened by the use of gold and strong colours. The first miniature (f. 1) depicts the reclining, sleeping figure of St. John on the island of Patmos. An angel shown flying in the upper section has just brought him Christ’s message. The green sea around the island is full of large fish and also has a boat with a dog on the cabin roof, three other islands and the Bosphorus. Pope Clement IX; Count Battaglini; H. Yates Thompson; Acquired by Calouste Gulbenkian at Yates Thompson’s sale, Sotheby's, 1920 (no. 37). N. J. Morgan – A Survey of Manuscripts Illuminated in the British Isles. Early Gothic Manuscripts (II) 1250-1285, London, 1988, p. 108-110, pls. Calouste Gulbenkian Museum – Album, Lisbon, Calouste Gulbenkian Museum, 2001, p. 85, no. 61, colourpl.